I know what you are thinking when you see the words “comfort shoes” – ugly, thick-soled beasts like your great aunt used to wear to deal with her bunion problem. At least I’m honest. But, there are a few stylish gems to be found in the comfort section, and I’ve unearthed them just for you! My top pick is this pair of zip-detail booties. They remind me of shoes from high-end, avant garde labels like Maison Martin Margiela or the Opening Ceremony house brand. I’d pair these with skinny jeans or trousers for a fall-perfect downtown look. → Buy the BeautiFeel Gemma Bootie, $388.95, at nordstrom.com; shipping and returns are free. The best way to add spice to an otherwise ordinary look? Add a pair of truly funky shoes, like these wedge pumps from Fly London. I can see these shoes with slouchy boyfriend jeans and a chunky knit sweater. 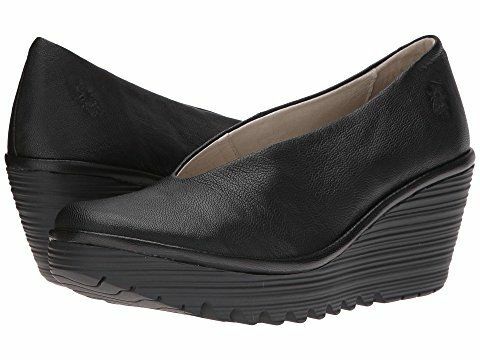 → Buy the Fly London Yaz Wedge Pump, $170.00, at zappos.com; shipping and returns are free. How fabulous are these boots? Add slim, cropped black trousers and beaded tank for a fabulous nighttime look that won’t leave your feet screaming for a seat. → Buy the Cole Haan Verdi Bootie, $398.00, at nordstrom.com; shipping and returns are free. Leopard print is always in style, which means these easy-to-wear wedges will be an ongoing favorite in your closet. They’re available in a range of both medium and wide widths. → Buy the Rockport 7 to 7 Wedge Pump, $139.95, at nordstrom.com; shipping and returns are free. Ok, so these crazy-colorful flatforms aren’t for everyone, but they are a ton of fun. I’ve never really bought into the FitFlop-as-exercise hysteria, but I hear they make crazy comfortable shoes. → Buy the FitFlop DUE Shiny Calf Hair Trim Flat, $184.95, at nordstrom.com; shipping and returns are free. I know I said there would be five top picks, but I couldn’t resist this bonus pair from the new arrivals section. These classic mid-heel pumps are an ideal work staple, from a label that means business when it comes to all-day work heels. → Buy the Cole Haan Chelsea Low Leather Pump, $298.00, at nordstrom.com; shipping and returns are free. Now that you’ve seen some of my favorite fashionable comfort shoes for fall, tell me your favorite labels for good looking shoes that you can actually walk in all day!